If you need a shed which is strong yet portable, take a look at our range of plastic sheds. Made from durable polycarbonate they are lightweight yet tough, offering flexibility for all your garden storage needs. 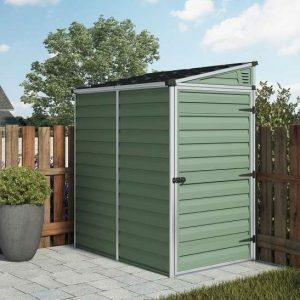 Our plastic garden storage sheds are available in a selection of sizes both large and small. Browse through our range online or come and visit our showroom in Devon to find the right shed for you. We offer delivery all over mainland England and Wales and our prices include installation too! For storage which is strong and secure, our plastic outdoor sheds offer the perfect solution. Tough enough to withstand the weather yet lightweight and portable, they offer the best of both worlds. Our sheds are made from the highest quality materials and built to last which is why we are one of the biggest shed suppliers in the UK today. Low cost, easy to maintain, and very portable plastic sheds now.